Happy Birthday to me, June 1st baby! For my birthday this year, I wanted to go to Italy...and at first planned on going with friends with Venice in mind, however everyone's schedule didn't work well with the dates that I chose. So from there that's when the idea came to me, "maybe I should take this trip solo." 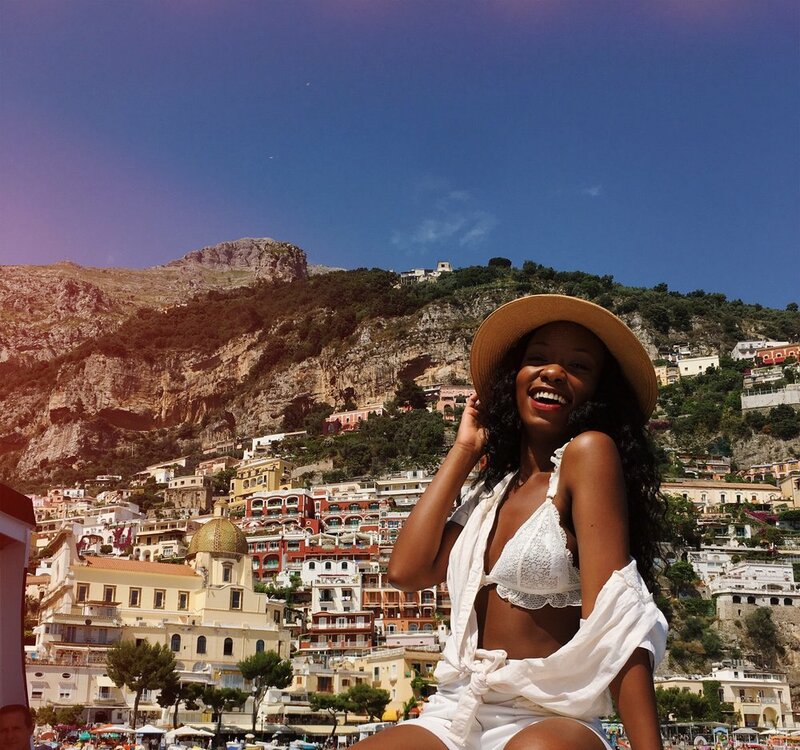 "You never really travel alone, the world is full of friends waiting to get to know you"
When I made the decision a month before my birthday to travel solo, I thought the perfect place for me to experience that would be Amalfi Coast, Italy. The reason why is because Amalfi is on the coast with pretty beaches and a few places to explore...it didn't feel like a massive city to me--where it could be a little daunting for a first time solo traveler. Although I'm not surprised by my fearlessness in traveling solo because naturally I enjoy my own company and I am confident while walking out into the world--so I knew that I'd be just fine. I stayed in a beautiful 5 star hotel, Hotel Ratio where the staff were really nice and accommodating. Pictured above is my hotel room balcony, with an ocean view and palm trees. Headed out to grab some lunch on my birthday and a pit stop by the pool! By the way this year I've invested in a few high leg swimsuits and I absolutely love them. This specific style definitely accentuates and compliments many figures! Just a menu for one please! This was my very first meal at the hotel, overlooking the ocean with a seafood salad, water, and fresh bread! "To awaken quite alone in a strange town is one of the most pleasant sensations in the world." Whenever I travel, I have to try the coffee. This coffee was good... like really good; strong, semi sweet with just the right amount of creamer and fresh enough to awaken my excitement for the day. The night before I had a conversation with the hotel staff about what I'd like to experience while there and they shared with me a downtown area in Vietri Sul Mare where I could go shopping and see many sites. Tip**: Before leaving the hotel, the staff provided me with a few business cards including the hotel's phone numbers, information for the taxi drop off/pick up location, a map...basically everything I needed to prevent me from getting lost or if I needed any help. This is super important for any solo traveler to definitely make sure you carry the hotel's information with you at all times. Another thing that was crucial for me upon going to Italy was providing my family with details of my stay, flight, and some of the things that I would be doing throughout my time there. I also researched emergency numbers like Italy police, or nearby hospitals just to have. I must say, I packed really light for my solo trip! I brought with me a carry-on luggage and my usual tote bag to fit all my things in. Traveling light was rewarding when picking out my outfits...as I knew exactly what I wanted to wear based on what I decided to do each day. Look at these beautiful hand painted vases, plates, tea sets and such! Tip**: People always ask me who takes my pictures lol, and my answer is the people I meet along the way! People are always willing to snap photos, especially when you're traveling, so if you ever find yourself traveling solo...don't be afraid to ask others! The hotel staff, new friends, strangers on vacation as well... were certainly excited to be helpful in that way. Strolling through the streets of Vietri Sul Mare! Everything was just so beautiful, artsy, + rustic. I either felt like I was in an Italian movie, or dreaming. "They say that travel broadens the mind, and opens a person up to different cultures and new experiences. This is certainly true, and if you are a woman traveling alone, even more so. It takes inner strength coupled with a sense of adventure to travel solo, yet it can be one of life's most rewarding experiences." Yup, the pizza was so good, authentic, fresh, and all mines ! On a boat sailing to Positano, Italy! Check out the amazing views below. Pulled up to the coast like...Made It ! Sitting on the side of the boat looking at how beautiful Positano is, happy that this moment was captured. Having lunch with my new friend Roberto from Milan, and food wise I was pleased everyday! Pictured above I had bruschetta, lobster pasta, and red wine. After lunch we did a some exploring and shopping! "Solo travel not only pushes you out of your comfort zone, it also pushes you out of the zone of others expectations." If you're lucky like me, you'll meet really nice people along the way who will explore with you, and ask to take your pictures without you even asking! There's a lot of walking + hiking up steps on the coast. When I got to these steps, I took some time at the top to catch some air and rest. See some of the below photos! Tip**: Never be afraid to go out into the world and explore--especially if solo traveling is something you'd like to try. The best advice I can give to a solo female traveler is enjoy yourself, do not be led by fear, and listen fully to your inner spirit + instincts, just trust yourself! Tip**: This picture I actually took myself! I set a timer on my iPhone camera and placed it on a cliff that was slightly higher from where I was sitting...the camera was faced on the selfie side. Everyone told me "Brittany you must try gelato!" --so I did, it was great. Listen, there's way too many picturesque moments on the coast of Italy. Everything is so rich in color and full of art! By the way, this was my favorite outfit worn while there. The shorts are 3.1 Phillip Lim and the bralette is Forever 21...as well as the hat! Leaving Positano, headed to Amalfi! "If you are waiting for someone to travel with you, you may end up waiting a lifetime!" When I got back to my room, to my surprise there was a birthday flower waiting for me and a bottle of wine #newfriends ! Looking at this photo I took during the night at my hotel made me realize how quickly this trip became a memory. As I stare at it I'm mesmerized at how beautiful the coast was at night and how much of a good time I had alone. I remember sitting out there on my last night; listening to music, journaling, eating pizza + dessert that the hotel had given me for my birthday and drinking a few cocktails. I felt so peaceful and grateful experiencing such an amazing time in Italy. I was blessed to have a great hotel + staff, smooth plane rides, and to have met kind people. My recommendation to all reading this, is to travel solo at least once in your lifetime! P.S. CHECK OUT MY ITALY VLOG BELOW ON YOUTUBE, BE SURE TO SUBSCRIBE!